Glen brought the show on the road to 8 cities in October 2015. This was his first time showcasing his own band there, and we look forward to many more in 2016. Here are the cities. he took by storm this tour. HEAVEN AT 37! GLEN DAVID PERFORMS ON SOUTHWEST FLIGHT FROM MSY TO LAX! On a recent flight to CA, Glen David and his sax player James Martin provided a little musical entertainment for the passengers. Actor / Director Michael Gross (Steven Keaton on Family Ties!!) posted this video, which has had over one million views! JAZZ AT 37,000 FEET` yesterday on my Southwest Airlines flight from New Orleans to Los Angeles when Glen David Andrews broke out in song. An unforgettable ride!!! Two major national papers have glowing reviews of "Redemption"
Check out all the latest reviews on the press page. 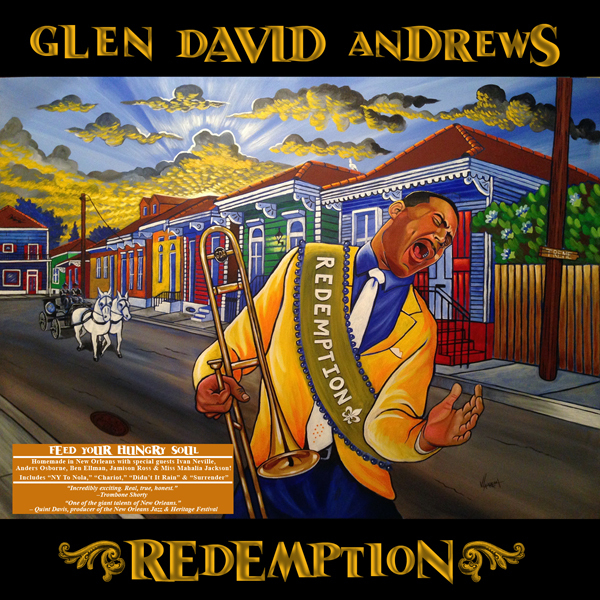 Glen David receives six "best of the beat" nominations, including best album for "Redemption", and artist of the year!! Glen David topped the nominations for Best of the Beat this year with SIX of them, Best Album, Artist of the Year, Best Male Vocalist, Best Trombone Player, and two Best Song nominations for "Surrender" and "NY to Nola". Offbeat's John Swenson calls "Redemption", "A stunning achievement, and a career-best highlight for both producer ( Leo Sacks ) and artist"., and David Kunian sums up his review with, " the recording we've been waiting for from Glen David Andrews". "Andrews and his band are a force. Their music is an electrifying combination of Funk, R&B, Jazz, Gospel and Zydeco, a joyful, communal noise that prompts, even the most casual listeners to lose their inhibitions, whoop, holler and shake the booty." You can follow Glen on Twitter@tremeprince, on Facebook at glendavidmusic. His youtube channel is tremeprince , and he is also on google + He will... "melt your heart, like butter"